Jeada Project Could one be successful? 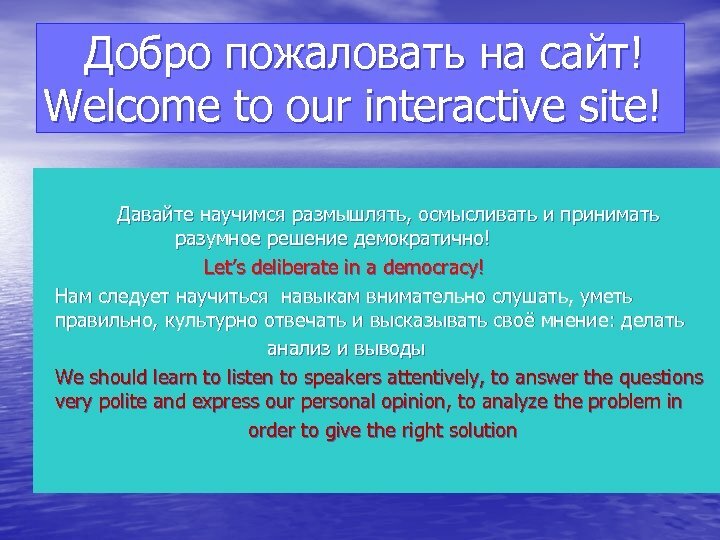 Developers: Group TSCS-1 B – Krivoshapkin Alexander, Mitina O. I. : a supervizer and consultant, English Teacher. 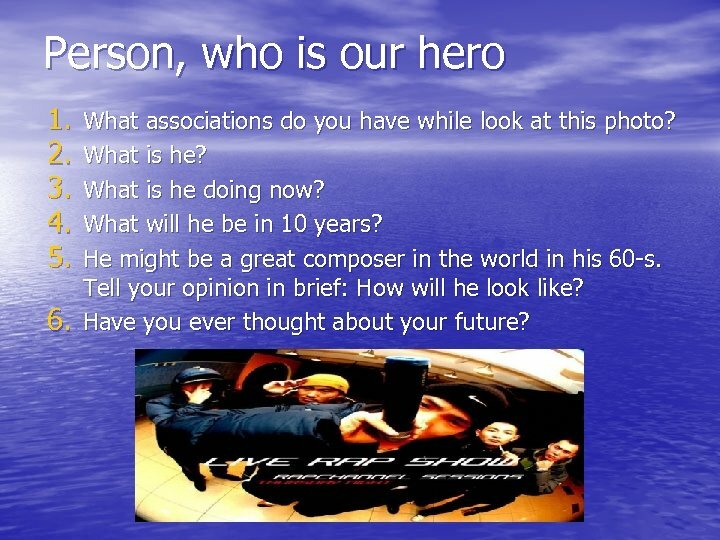 Person, who is our hero 1. 2. 3. 4. 5. 6. What associations do you have while look at this photo? What is he doing now? What will he be in 10 years? He might be a great composer in the world in his 60 -s. Tell your opinion in brief: How will he look like? Have you ever thought about your future? 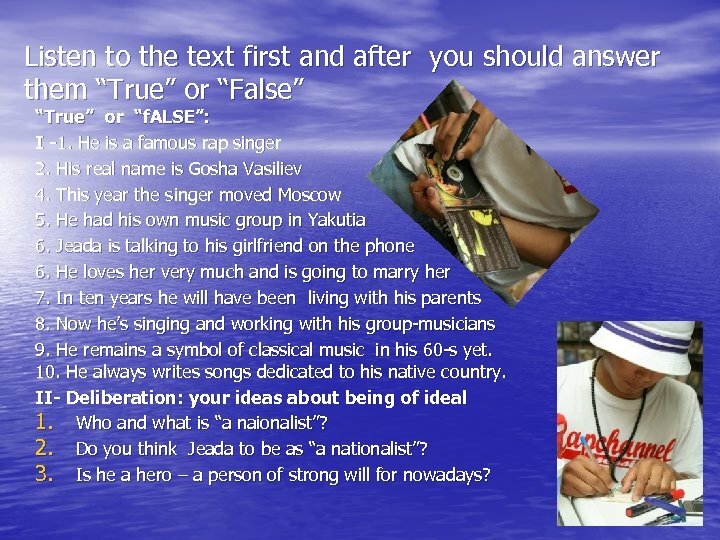 Listen to the text first and after you should answer them “True” or “False” “True” or “f. 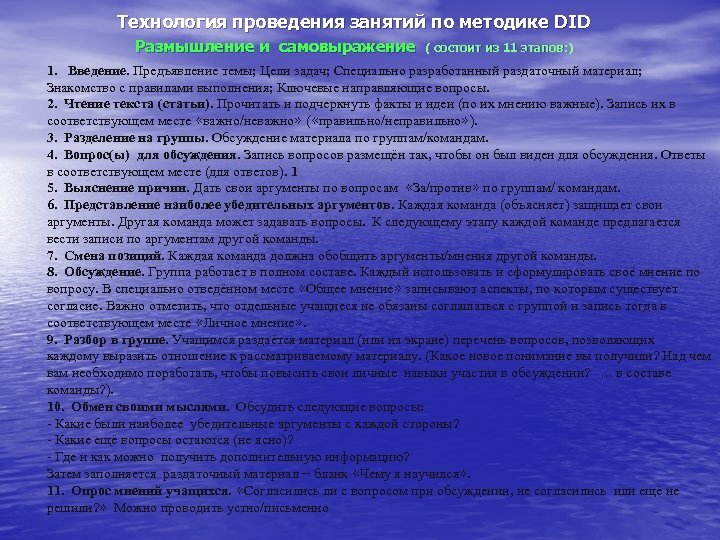 ALSE”: I -1. He is a famous rap singer 2. His real name is Gosha Vasiliev 4. This year the singer moved Moscow 5. 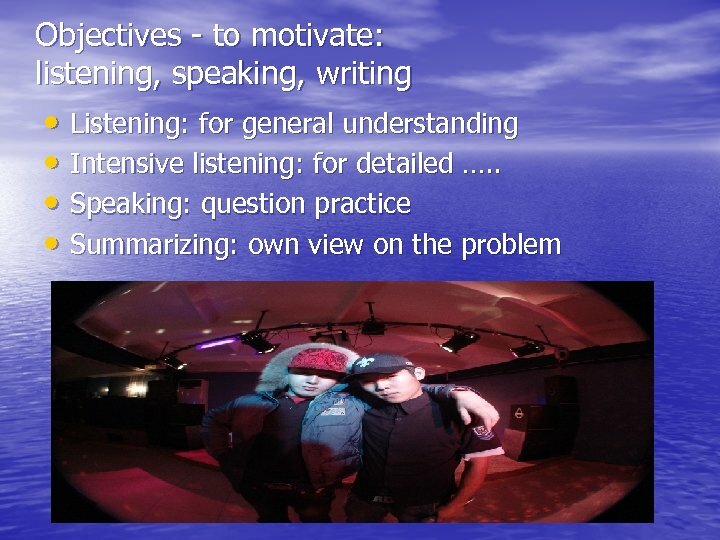 He had his own music group in Yakutia 6. Jeada is talking to his girlfriend on the phone 6. He loves her very much and is going to marry her 7. In ten years he will have been living with his parents 8. Now he’s singing and working with his group-musicians 9. He remains a symbol of classical music in his 60 -s yet. 10. He always writes songs dedicated to his native country. 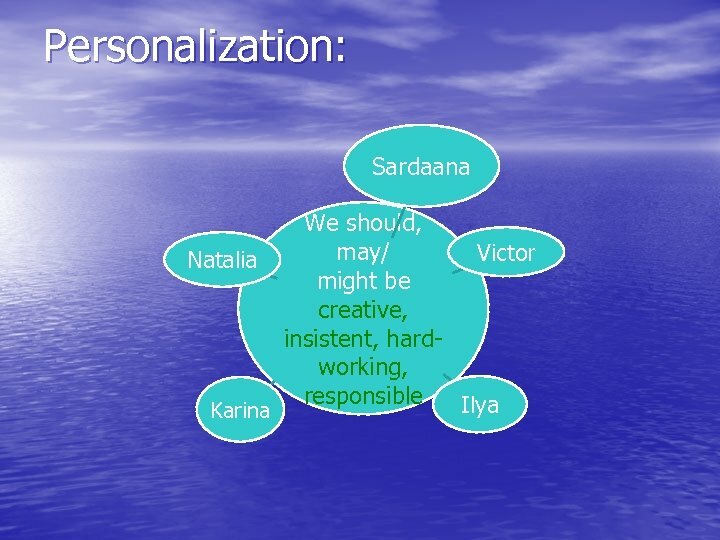 II- Deliberation: your ideas about being of ideal 1. Who and what is “a naionalist”? 2. Do you think Jeada to be as “a nationalist”? 3. Is he a hero – a person of strong will for nowadays? 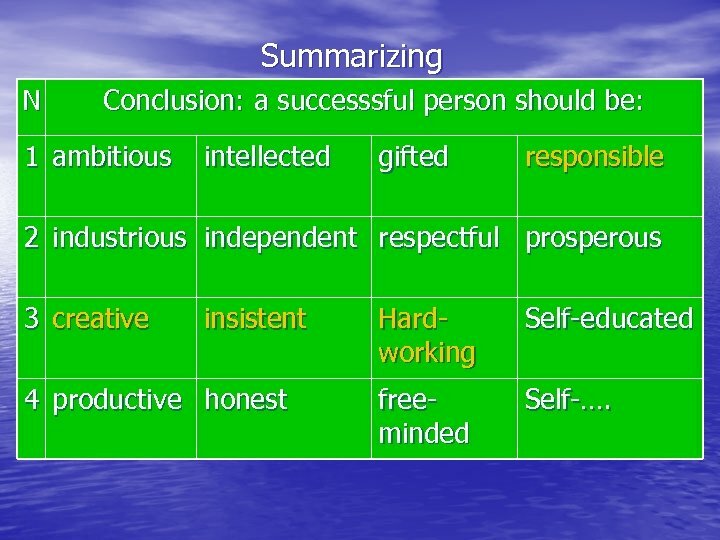 Summarizing N Conclusion: a successsful person should be: 1 ambitious intellected gifted responsible 2 industrious independent respectful prosperous 3 creative insistent 4 productive honest Hardworking Self-educated freeminded Self-….